This head of a bodhisattva, or “compassionate being”, bears the stamp of great nobility. It has a broad forehead, regular features, slender nose, determined chin, and the loose hair is knotted at the base of the skull. The workmanship is expressive and deliberately realistic. The facial features and the intensely refined treatment of the delicately defined mouth and wide- open eyes convey a dreamy expression reminiscent of the Hellenistic period. 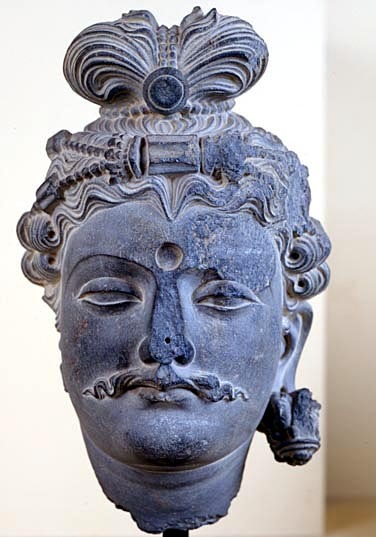 Such Greek influences, believed to stem from the conquests of Alexander the Great, are typical of the Gandhara school in its Afghan variant and are the defining features of the local statuary which flourished at the Hadda site where this piece was excavated. The face was modelled in untreated clay which was dried and then painted, as revealed by the polychrome traces; compared with schist or stucco, the technique involved allowed for enhanced expressivity and realism. The head comes from the Tapa-i-kafariha monastery where the various chapels were decorated with series of large Buddhist sculptures. The figures in these sculpted scenes must have occupied the upper areas where episodes from the life of Buddha were depicted, gradually unfolding before the eyes of the faithful as they passed. The face attests to a relinquishment of Indian influences in favour of a renewed Greek tradition. This style, associated with Gandhara art under the reign of the Kushans, was to reach its pinnacle in the 2nd-3rd century CE, and would influence the cultures that lay along the Silk Road as far as China.